Liquid Samplers made from SS 304 Q / S 316 Q. Cup Sizes available from 50 ml - 500 ml or as per requirement. Length upto 10' as per desire. The liquid sampler KLL-S has technically been designed for the application in connection with the electric contact meter KLL. 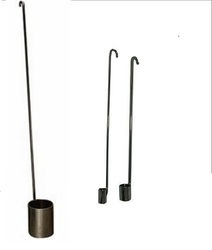 With this combination-design, it is possible to obtain liquid samples from any desired depth. Basically, the liquid sampler consists of three parts-piston, tube and releasing weight. We are proficient to proffer a wide range of Steel Sampler. These are available in different specifications that meet customer’s demand. Round - 35 mm /12 mm thickness. We are engaged in offering S. S. Liquid Sampler. It is largely used in various industries such as pharmaceutical, food, and chemical. The clients can avail it at very reasonable prices. It is simple, quick and easy to use. It is perfect for quick sampling most liquids.